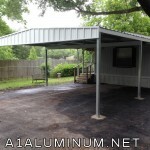 For Ms. “M” in Houston we installed a 24′ x 25′ Aluminum carport with 5″ Super gutter. 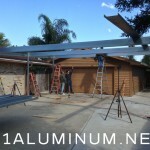 As you can see we raised the carport above the fascia and installed a fill panel. 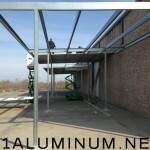 We do this often to give customers more height in their carports and patios covers. 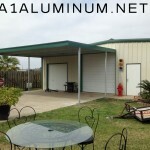 We installed 3 Commercial steel carports for this company down in San Leon. We also re-sheeted and walled-in a small building at the site. 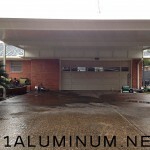 Below you see a 24′ x 30′ steel carport with PBR panel sheets painted white. Posts are mounted on the concrete and the trim is Sahara Tan.